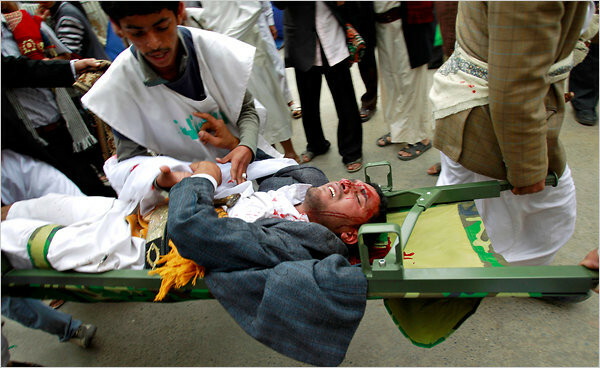 A medic helped an injured anti-government protester in Sana on Friday. SANA, Yemen — Security forces and government supporters opened fire on demonstrators on Friday, killing at least 30, as the largest protest so far in Yemen came under violent and sustained attack in the center of the capital, Sana. SANAA, Yemen — Yemen's embattled president on Tuesday accused the U.S., his closest ally, of instigating the mounting protests against him, but the gambit failed to slow the momentum for his ouster. 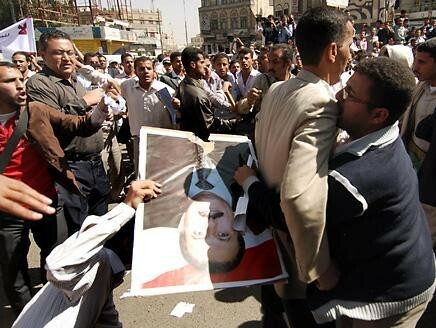 Hundreds of thousands rallied in cities across Yemen against the government of President Ali Abdullah Saleh, in the largest of the protests of the past month, including one addressed by an influential firebrand cleric, a former ally of Saleh, whom the U.S. has linked to al-Qaida. Article from 3rbnews.com and written in Arabic. The Google transalation is edited by Roger. The sources said that eight of the demonstrators were injured when the police tried to disperse the demonstration by youth in the city. Witnesses said police used batons to disperse demonstrators. In Sana police were seen attacking civilians, demonstrators who were university students at the entrance to the University of Sana. Sticks and stones were thrown. Thousands of supporters of the ruling party took control of the Tahrir Square in the capital for several days. 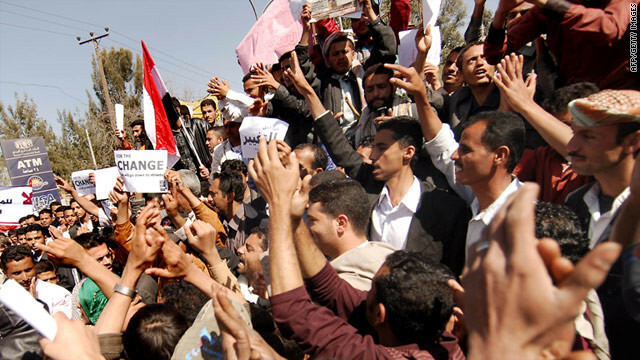 Yemen protesters: "First Mubarak, now Ali"
Sanaa, Yemen (CNN) -- Hundreds of anti-government protesters marched toward a presidential palace in Yemen on Sunday, calling for regime change in the Middle Eastern country. Some of them chanted, "First Mubarak, now Ali," referring to Yemeni President Ali Abdullah Saleh and Hosni Mubarak, who recently resigned as president of Egypt after nearly 30 years in power.